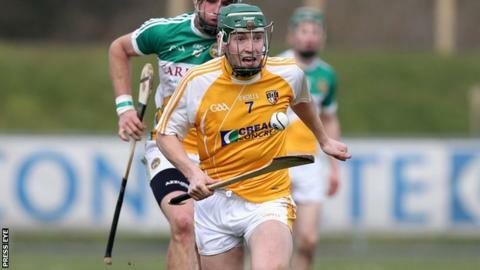 Paul Shiels hit 1-10 as Antrim secured a place in the Leinster SHC quarter-finals as they beat 14-man London. The Saffrons make it through from the Qualifying Group series with the game against Laois to spare. After leading 0-6 to 0-5 at half-time, Shiels netted for Antrim but despite Noel McDonald's red card, Martin Duggan and Kevin Walsh hit London goals before the Saffrons pulled clear late on. Shiels was on target as the Saffrons moved into a 0-6 to 0-2 by the 20th minute, but London clawed their way back with scores by Peter Phelan, Darren Moore and Kelly, who claimed his third point. After 10 first-half wides, Antrim finally managed to beat Barrett with just a minute played in the second half as Shiels collected a Neil McAuley pass before drilling to the net. London were reduced to 14 men in the 45th minute when defender McDonald received a straight red card. But the Exiles stunned the hosts with a Martin Duggan goal four minutes later and some slack Antrim defending was punished once again as Walsh stole in for London's second goal. But the final 15 minutes was a story of Antrim dominance. Substitutes Stephen McAfee, Conor Johnson and Barry McFall made a big impact, with McAfee and Johnson hitting eye-catching scores. Eoin Campbell also thumped arrowed over a long-range effort, and three more from the accurate hurl of Shiels made the victory safe. And they came close to getting a second goal, but once again, Barrett came to the rescue, keeping out PJ O'Connell's flicked effort. Shiels hit 12 points in the 0-23 to 2-11 win over Westmeath and then notched 0-11 in last weekend's 2-18 to 1-17 win over Carlow. The Saffrons face Laois in their final Leinster qualifier at Portlaoise on 25 May. The winner of that game will earn a home Leinster quarter-final against Wexford with the losers facing an apparently tougher last-eight tie against Galway.